Flights leave Havana for Baracoa just once a week. As it turned out, I left for the East on the very day that Fidel Castro made his first speech at the University in many years – the official sign of his return to active political life. I was sorry to have missed it. Nevertheless Cuba turned out to be everything I had imagined – and more. In the fields along the road from the airport to the town of Baracoa, peasants were preparing the land for sowing, working with simple hoes or ploughs pulled by oxen. Others on the road travelled by bicycle, on horseback or on foot; there were horse-drawn carts and those drawn by a man – under clear blue skies, scorching sunshine and amid tropical trees and vegetation. The calm blue sea didn’t look as if it could suddenly turn wild and swallow up buildings and people – as it does during the frequent hurricanes and tornadoes. But I hadn’t expected that the only way to reach a place beyond walking distance would be to take a bici-taxi – the Cuban version of a rickshaw – powered by a man cycling. When I failed to find a “proper” taxi I was forced to hire one of them, something I had always refused to do in China. Walking through the town I had my first encounter with the heroes of the 19th century revolution against the Spanish Conquistadores. I noticed once again, as I had in Argentina last year, that Latin America is perceived as a single entity: “Nuestra America” in the words of José Martì, (Cuban poet, writer and leader of the movement for independence) where respect, admiration and almost hero worship is felt for all those who fought for independence, irrespective of their nationality: like Simon Bolivar, a Venezuelan, José de San Martin, an Argentine, and even the Italian Giuseppe Garibaldi. Monuments, plaques and banners with the names of obscure fighters or martyrs can be seen everywhere. I was moved in Sancti Spiritus to see a fresh flower under the statue of a native combatant who had died more than 150 years ago. 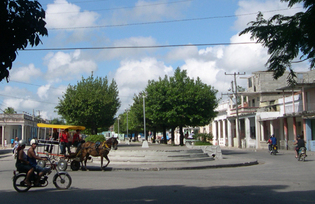 Baracoa is the oldest city in Cuba. Christopher Colombus is said to have arrived there during his first voyage and planted a cross in the sands of the future harbour of Baracoa. The antique cross, known as the Cruz de la Parra, is now kept in the Cathedral. 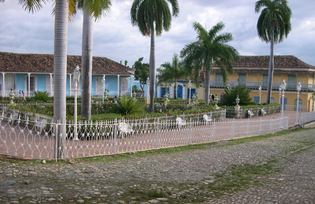 The first Spanish settlement was founded in Baracoa in 1511. Hatuey, the native cacique, organized attacks against the conquistadores and after his capture, was burnt at the stake. In the Museum of Cuban Art in Havana there is a picture of Hatuey with the caption “I don’t want to go to Paradise” . According to legend a Catholic priest tried to convert Hatuey to Christianity before his gruesome death in order to secure the salvation of his soul. Hatuey asked whether dead Spaniards go to Heaven too and on receiving a response in the affirmative replied in that case he would rather go to Hell. 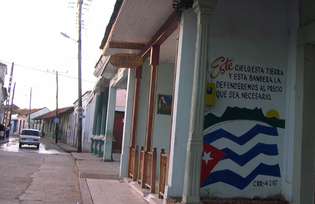 In Yara on 10 October 1868, the landowner Carlos Manuel de Cèspedes proclaimed the independence of Cuba – the famous Grito de Yara which began the 10 Years’ War against the Spanish. He also asked for the abolition of slavery and freed his slaves. He is considered the “Father of the Country” and there is a story behind this as well. He didn’t submit to blackmail by the Spanish authorities – which cost him his own son’s life – saying “All Cubans are my sons”. The two popular uprisings of 1868 and 1895 started in Baracoa and the appeal for the 1895 independence war was launched from Baire, thirty kilometres from Bayamo. At Dos Rios, José Martì was killed in battle by the Spaniards. His anti-imperialist ideology with its social and solidarity features influenced Fidel Castro strongly. In Ba and Santiago on 26th of July 1953 Fidel Castro started the attack on Batista’s dictatorship. 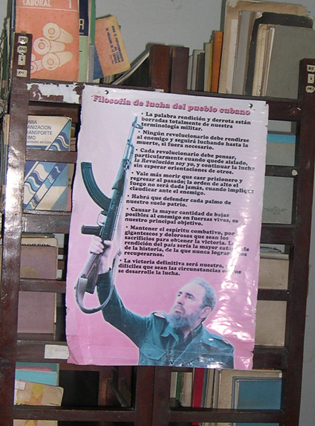 What I saw on the walls of Baracoa were slogans from the 50th anniversary of Fidel’s revolution in 2009. The stencils of Fidel, Che Guevara and Camilo Cienfuegos were of course new, but the slogans were traced over old writings that had probably been there for decades. They all stressed the ideals of unity, common work and the struggle. Unidos venceremos, Dignos y unidos, La conservacion de la revolucion es la tarea (task) de todos. The same message can be seen printed, painted and written on walls and banners throughout the island. I journeyed back to the capital from Baracoa in stages, travelling by coach and staying in casas particulares. These are houses where Cuban families are allowed to offer lodging to foreigners, serving breakfast and dinner on request. The formula suited me perfectly as I wanted to see the countryside and meet the Cubans. The casas particulares are usually pastel-coloured, single-storey buildings with a small garden at the front and a patio out the back; but some of them are old colonial houses with high wooden ceilings, imposing halls, stained-glass windows, stuccoes and frescoes. The rooms for the tourists (no more than two rooms per house) must satisfy certain requirements such as having a separate bathroom, hot water, fans or air conditioning, a fridge, and sometimes a TV set. The owners pay a monthly rate to the government and an income tax on the annual income. Most of the tenants I met were retired people with university background: teachers, researchers, physicians, engineers . The priority goal and attainment of the socialist revolution is in fact achieving full literacy for all its citizens. From the very start teachers were sent to the rural areas to teach adults to read and write. In Bayamo I spoke with one of the teachers, a young girl at the time, who told me how tough an experience had that been. It reminded me of the tales of some of Mao’s “Red Guards” I had met in China. Along the route, in the countryside and in the streets of the small villages you can see primary schools and pre-schools which cater for local children as well as those transported in from outlying rural areas. In the towns there are basic secondary schools and pre-university institutes while the bigger cities have universities offering 6-year courses in Medicine and 5-year courses in all the other subjects. All levels of education are completely free, including postgraduate and optional courses like language courses. All graduates get a job (or at least they used to get one) and are paid an average salary of between €20-50 a month by the government. The standard of life is low, for some people very low, despite the government issue ration cards which provide for the basic essentials. In the towns people make ends meet through informal micro-businesses; in the rural areas about 30% of the land is owned by the campesinos who are allowed to sell their surplus products. Now young people are encouraged to attend vocational courses to meet the need for technicians and craftsman such as mechanics, plumbers and carpenters but they are not guaranteed employment. This is one of the reasons for discontent and disaffection amongst young people, some of whom abandon their studies and start up small business or turn to illegal practices such as prostitution, scams, bag-snatchings and blackmail; it is called jineterismo from jinetear – luchar which in Cuba means “do something to survive”. Next year the Cubans are preparing to celebrate the 50th anniversary of the battle against illiteracy. On 20 September, Education Day, the Minister for Higher Education stressed the importance of the training and updating of teachers, and the need for linking university studies with the country’s development needs. Agricultural and Architectural Sciences were indicated as a priority in the 2010/2015 Plan. He didn’t conceal the country’s economic difficulties and made an appeal to citizens’ sense of responsibility, urging families to support their children in a holistic approach to education. As education represents a major investment for the Cuban government, graduates are not permitted to expatriate or go abroad except for very short periods or for officially assigned jobs. I met a language graduate who had worked three years in Romania, a physician who had lived for three years in Asmara and a physical education teacher who was leaving for a two year’s stay in Venezuela – (resemblances with the Chinese policy again). Those who are allowed to go to the USA for a short period (from 3 to 6 months) and then choose not to return, cannot enter the country again. It is a life choice. Some take the risk, as they easily find well-paid jobs. Television programmes are basic: news, educational broadcasts, round table discussions, documentaries, language lessons and art laboratories. In the afternoon, there is a Latin American soap opera (the same one that was recently broadcast on Italian TV), programmes for young people and with young people, dealing with the problems and interests of their age group. I watched debates about the expulsion of the Roma people from France and Europe’s drift to the right, its racist policies and measures against migrants(with reference to Italy as well). Documentaries have geographical or cultural interest such as for example: traditional feasts in China. Fidel Castro is nearly always present on the TV news (Noticiero); I saw him launching his two books: La Victoria Estrategica and La Contraofensiva Estrategica and he has his say on the news topics of the day. Sometimes he reads his addresses but I saw him give two impromptu speeches about the dangers of man-driven climate changes and of nuclear war, with quotes and wide references to examples and documents. An old lion, but still on the ball and combative! The Cuban daily is the GRANMA (Grandmother) named after the ship that carried Fidel Castro, Che Guevara and other patriots to Cuba from Mexico in 1956. In bigger cities it is sold by street vendors, in small towns it is collected by the subscribers – in order not to waste paper, only those who have subscribed to it can get it. I managed to get hold of a copy with Fidel’s speech to the university students and also a copy with the Minister of Education’s address on 6 September, the opening of the school year. In Camaguey the local paper Adelante has only a Saturday/Sunday edition. 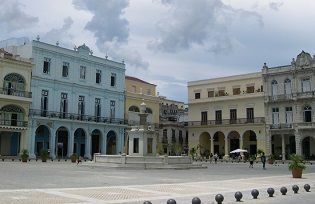 Towns have a typically Spanish colonial layout as in most countries in Latin America: a central square with the Cathedral and the most important buildings, a monument and a small park. Buildings are usually painted in soft colours (pink, light blue or green). Churches are everywhere, disproving the idea of Cuba as an atheist country. The Cubans are mostly Catholics and very religious; in all the houses I saw images of saints and of the Virgen del Cobre or Virgen de la Caridad; she was crowned Patron Saint of Cuba by Pope John Paul II during his visit to Santiago de Cuba in January 1998. Her feast day is on 8 September. Many other religious fellowships are present in Cuba with churches, schools, seminaries: Protestants, Methodists, Baptists, Presbyterians and others. There is an amusing story about Fidel Castro who is said to have obtained the remission of his sins, in spite of being an atheist. The socialist revolution had two more aims: free healthcare and homes for everybody. The promises were fulfilled. There are consulting rooms everywhere, with people queuing to get therapies and prescriptions; medicines are free if they can be found in Cuba. It is possible to obtain medicines offered on the international market at specialized chemists – these have to be paid for in convertible pesos. (Convertible pesos are one of the two official currencies in use in Cuba, worth 25 times more than the national pesos by which Cuban state workers are paid). For the rural areas far from health facilities there are special services. In Santiago I saw a centre where heavily pregnant woman peasants were gathered, waiting to be taken to hospital to give birth. Homes are free: officially they are state-owned but they can be passed on to one’s children and grandchildren as in the case of the casas particulares. For the new houses now being built in the cities, the recipients have a small sum deducted from their salary and when the homes are paid off they will be at their disposal free of charge. Houses are not sold, but can be exchanged, a small one for a bigger one, or one in town for one in the country. Nonetheless, Cubans love their island and their way of life; after trying “the wonders of progress” abroad many of them prefer to return home. Cubans are an incredible mixture of races; apart from the indios – who were exterminated by the Conquistadores in a very short time as a result of bad living conditions, hard work and disease – Cubans today boast ancestors who have arrived at different times from all corners of the world. One sees the ebony bodies of African slaves’ descendants, rastas with dreadlocks who look like they have just arrived from Jamaica, dark-complexioned men with white beards and hair such as can be found in Ethiopia, or gentlemen sporting moustaches and pointy beards – direct descendants of Don Quixote – women with Creole features and fair-colouring which they try to defend under the shade of an umbrella, (as in all developing countries), beautiful blue, green, brown, round or almond- shaped eyes and Spanish or Chinese surnames. The girls are beautiful, slim and slender but with a tendency to run to fat, and when they take off their school uniforms, the young people look like young people all over the world , with tattoos, body piercing, dyed and gelled hair, short skirts or low-slung jeans, low-neck blouses , exposed breasts (I hope without implants), sometimes with an evident search for unconventional look. And then there is music everywhere. Almost all Cubans play an instrument or sing in a choir and people can be seen dancing in the streets or at their place of work. There are Casas de la Trova in every town. The first was set up in Santiago in the 20’s. The trovadores mix peasant songs and Spanish and French styles with tunes of their own composition. In the Casas de la Trova groups practice in the morning and in the evening Cubans go there to enjoy music, drinks and (hopefully) some fresh air. 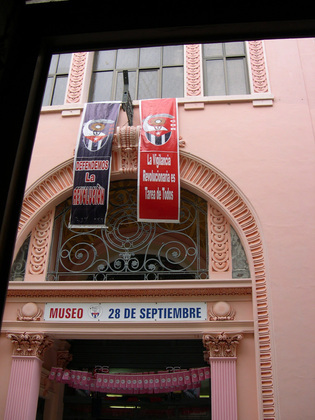 In Bayamo the name of the Casa de la Trova is “The Beatles” and outside it there are life-sized statues of the Famous Four. (This is another feature shared with China: statues in the calles or plazas representing common or famous people, like the statues of people playing dominoes in the open air, as they do in China with mahjong). This is not all I saw and experienced in Cuba – it is impossible to relate everything. What I have written has no pretensions to being comprehensive, correct or objective – this is “My Cuba”! Olga Iazzarelli has lived and worked as a teacher in Italy, China and Ethiopia. She has travelled extensively, doing volunteer work in Albania, Chile, Georgia and South Africa.